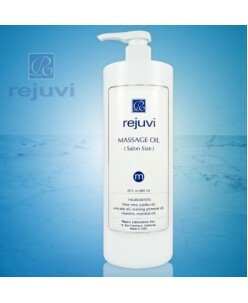 Rejuvi m Massage Cream - Scrubbing & Whitening is a dual-acting, at-home treatment for relieving stress and tension while encouraging cell renewal and brighter skin. Gentle jojoba esters delicately buff away dead skin cells, while titanium dioxide helps whiten your complexion, for even radiant skin. Ingredients Aloe Ve..
Rejuvi Massage Cream is a lovely mineral based oil-free cream that provides a relaxing facial and body massage. It delivers long lasting moisturization with a lovely relaxing scent. Directions: Apply a sufficient amount on the face and massage with a circular motion. 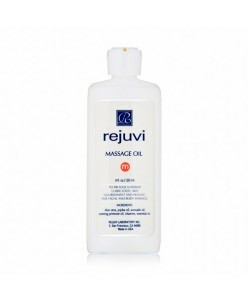 Remove excess cream with a tissue and then cleanse the s..
Bathe your skin in Rejuvi Massage Oil when you need to take some time to yourself and regain your peace of mind. An intoxicating blend of essential oils and vitamins soothe your face, body and mind for the ultimate skin treatment. 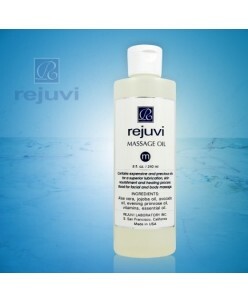 Emollient jojoba oil and aloe vera encourage repairing of the skin, instantly relieving rough areas..